All Tea-d Up The new Emma Bridgewater greeting card collection from Woodmansterne, based on a licensing agreement with the well-respected pottery brand, is published proof that riches are often hidden at the bottom of a pile of paraphernalia on your desk. Lee Keeper, Woodmansterne’s creative director poured out the story of how the collaboration came about and reveals it was very nearly a wonderful opportunity that was missed. Above: Woodmansterne’s creative director Lee Keeper (right) with designer Hope Glass and the giant teapot Emma Bridgewater gave to the publisher to christen the licensing relationship. Left: The Woodmansterne cards feature well-known Emma Bridgewater designs with some specially created messages, all bearing Matthew Rice’s hand-created lettering. Below: The Emma Bridgewater brand sits so well with Woodmansterne’s artistic and company values. Bottom left: Being a British brand, that produces all its products in The Potteries, Emma Bridgewater is a great fit with Woodmansterne. 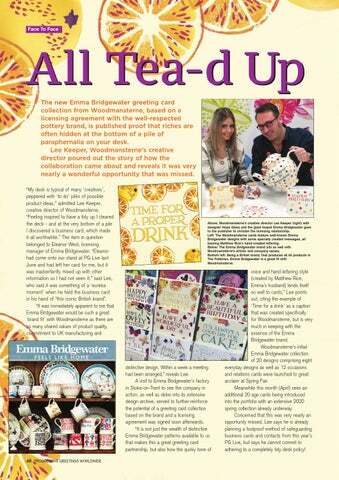 voice and hand lettering style (created by Matthew Rice, Emma’s husband) lends itself so well to cards,” Lee points out, citing the example of ‘Time for a drink’ as a caption that was created specifically for Woodmansterne, but is very much in keeping with the essence of the Emma Bridgewater brand. Woodmansterne’s initial Emma Bridgewater collection of 20 designs comprising eight everyday designs as well as 12 occasions and relations cards were launched to great acclaim at Spring Fair. Meanwhile this month (April) sees an additional 20 age cards being introduced into the portfolio with an extensive 2020 spring collection already underway. Concerned that this was very nearly an opportunity missed, Lee says he is already planning a foolproof method of safeguarding business cards and contacts from this year’s PG Live, but says he cannot commit to adhering to a completely tidy desk policy!